This is a Centroid T400 AC-servo retrofit to a specialized ring grooving lathe. 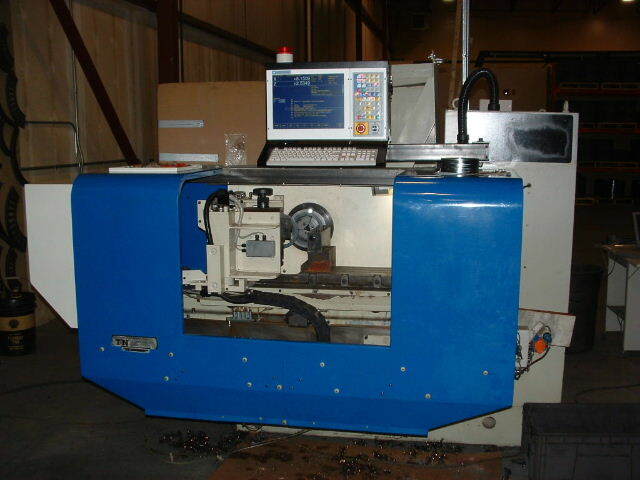 I completed three of these machines for a Canadian customer between February 2005 and April 2006. The machines have a stack loader assembly riding on the tool carriage, plus a retractable part chute behind the table. Rings are pressed into place by the stack loader; gripped by the hydraulic collet; cut; and ejected into the part chute, all automatically. When the machine senses the stack is low it rotates the loader to the left, moves the table over to the left-side load door; and alerts the operator to load more rings. Running nearly continuously, each of these machines can cut over 2000 parts per shift. I installed the new control components into the original Wickman cabinet. 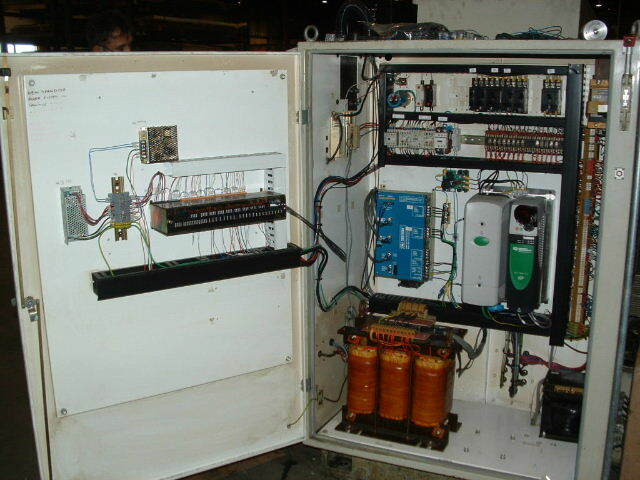 The servo drive is center left; Control Techniques spindle drive is center right; and the PLC I/O unit and supporting power supplies are on the cabinet door. I kept the transformers, circuit breakers, contactors and isolation relays from the original control.